Head, A (2013) You, me & everyone in Portsmouth. Portsmouth Guildhall, 25 - 26 October 2013. 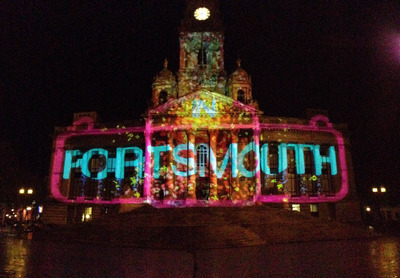 Anthony Head is the digital projection artist part of the team hoping to create the UK’s largest ever crowd-sourced story project in the city of Portsmouth this October. 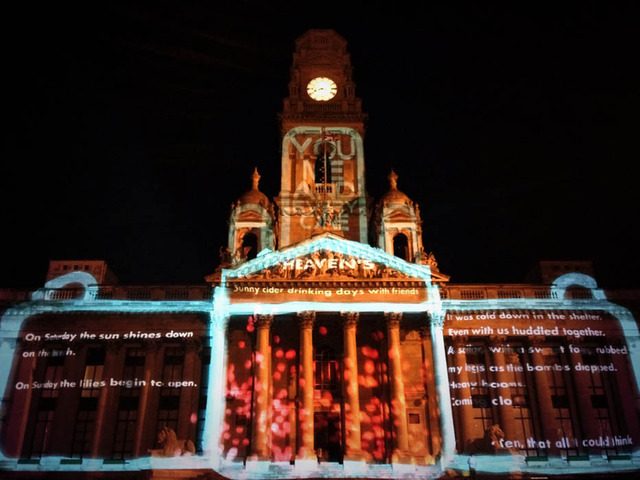 On the evenings of Friday 25 and Saturday 26 October You, Me & Everyone in Portsmouth, using a huge digital projection, created by Anthony, will tell an original, epic tale of modern Portsmouth at the city’s iconic landmark, the neo-classical Guildhall. This true tale of the city, crowd-sourced from the community itself and using powerful projection technology, will pour across the Guildhall in an immersive literary spectacle. At the heart of You, Me & Everyone in Portsmouth is the connection between story and audience. In the months preceding the event, the project team has engaged with 2,000 people as well as a variety of venues across Portsmouth in sourcing ideas, inspiration and experience for this epic tale. The team is led by writers from the Portsmouth area Amber Dodd, Annie Kirby, Lucy Flannery and Portsmouth Poet Laureate Sam Cox, whilst Anthony will develop the projection artwork for this free public event. Anthony said: “This is the largest and most ambitious outdoor projection I’ve been involved with to date. The Guildhall is 60 metres wide and almost as high, and it’s a huge challenge to fill it with the stories gathered from the people of Portsmouth. “Collaborating with the writers and the production team has been a great experience. As a cross-disciplinary project mixing writing and projection art, we’re redefining urban story telling.” You, Me & Everyone in Portsmouth is being produced by ReAuthoring, which explores innovative ways to connect writers and readers. Commenting on this project, co-director Greg Klerkx added: “We feel this project is a fantastic chance for everyone in the community, regardless of their background, to be part of a bigger story and see that story come to life in an amazing way.” You, Me & Everyone in Portsmouth is core funded by Arts Council England with further support from Portsmouth City Council, Portsmouth Cultural Trust and the New Theatre Royal Portsmouth. Images reproduced by permission of Anthony Head.